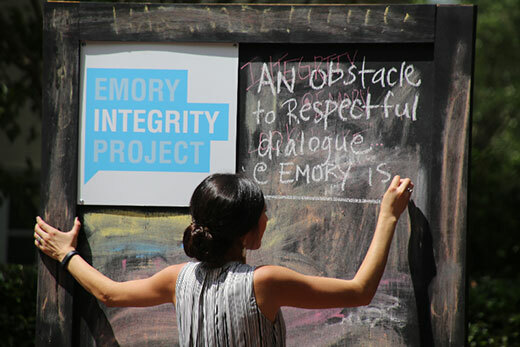 The Emory Integrity Project invites students to grapple with important questions: What is integrity? What does it look like? How do you build a true culture of integrity at Emory? Chalkboards strategically located across campus will present a series of rotating prompts that invite community feedback. The Emory Integrity Project invites students to submit artwork for “Stand #withMalala,” a community visual arts exhibit to be held Sept. 19 through Oct. 19 in the Dobbs University Center Art Gallery. Submissions will be accepted through Sept. 9. They may include painting and drawing, photography, graphic design/illustration, and written expression, such as essays, poetry or short stories that are capable of being displayed. Pieces selected for installation will also be entered into the #withMalala Challenge, a digital art project hosted by the Malala Fund and Adobe Systems. Student artists selected for the Emory exhibit will also receive two complimentary tickets to the Oct. 18 “I Am Malala” lecture featuring Shiza Shahid. For additional guidelines or to submit work, visit here. Emory University is an institution deeply rooted in ethical engagement — a conviction spelled out in its fundamental statements of mission, vision and ethical principles. But this semester, ethics and integrity will take a new and very visible role within the Emory experience, engaging students as never before. Before arriving on campus, most incoming first-year Emory students had already received a copy of the acclaimed memoir, “I Am Malala,” which will serve as a focal point of campus-wide discussion and events throughout the fall semester. The book tells the story of Malala Yousafzai, who was shot by the Taliban for advocating for her right to education. Emory students will also notice chalkboards strategically located within buildings and common spaces across campus, from the Quadrangle and Cox Hall to the Woodruff Physical Education Center and the Cannon Chapel breezeway. The boards will present a series of rotating prompts — such as “Leading with integrity looks like...” — that invite community feedback. What is integrity? What does it look like? How do you build a true culture of integrity at Emory? What difference would that make in the culture of student life? The activities herald the launch of the Emory Integrity Project (EIP), a comprehensive effort to promote and develop a culture of ethics and integrity throughout Emory’s undergraduate experience seeded by a $2.6 million grant from the John Templeton Foundation. The rollout of the EIP coincides with rising national dialogue about the culture of civility on U.S. college campuses, Wolpe acknowledges. Focused primarily on undergraduates, the five-year project presents a comprehensive program of co-curricular activities designed to challenge perspectives, encourage ethical reflection, and promote moral courage and principled action. The EIP is supported by both a faculty advisory board, which is led by Wolpe, and a student advisory committee, under the direction of Emily Lorino, EIP program coordinator. Starting this semester, integrity will become a narrative theme woven throughout the next four years of the undergraduate experience, explains Wolpe. Residence advisers, sophomore advisers and orientation leaders — all told, around 400 students — received special training around the EIP and how to engage peers in ethical decision-making. Integrity also has a new place in the Creating Emory curriculum presented to first-year students during orientation “to help students start talking about this right off the bat,” says Becka Shetty, EIP assistant director. Emory undergraduate students will receive monthly “case studies” touching upon scenarios relating to business, politics and sexual ethics. The case studies will be examined in residence hall programs as well, with discussions that feature key Emory faculty members. The first campus-wide case study will ask: “Should college students be required to vote? Would you support mandatory voting at Emory? Why or why not?” Open discussions will be hosted at Wonderful Wednesday, Sept. 7, from noon to 2 p.m.; at Kaldi’s Coffee & Conversation, Sept. 14, at 2 p.m.; and at a Faculty, Staff and Student Forum, to be held Sept. 28, at 5:30 p.m. in the Center for Ethics, Room 102. Student artists will be invited to respond to the bravery of Malala Yousafzai by participating in “Stand #withMalala,” a community visual arts exhibit to be held Sept. 19 through Oct. 19 in the Dobbs University Center Art Gallery. Applications will be accepted through Sept. 9. In partnership with the Center for Civil and Human Rights, the EIP will host a lecture by Shiza Shahid, founding CEO of the Malala Fund, on Oct. 18 in the Glenn Memorial Auditorium. Special programs will also be presented to campus Greek life leaders with a focus on community integrity, ethical decision-making and wellness issues, especially around recruiting and parties. For more information about the EIP, visit the Emory Integrity Project website, Instagram and Facebook pages, and follow hashtags #EmoryIntegrity and #WithMalala.